In Java, .properties files are used for storing key-value pairs, most typically for text localization. However, by default they are saved in ISO-8859-1 encoding, not in Unicode. Since many languages use characters not included in this encoding, these characters will need to be expressed using Unicode escape sequences. Of course, such files are inconvenient to read and edit. 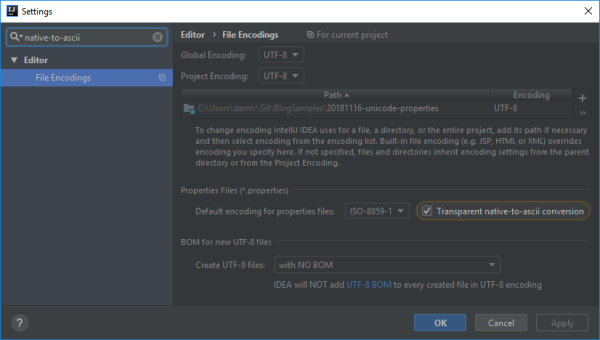 Fortunately, IntelliJ IDEA can automatically handle conversion between the Unicode literals and their corresponding escape sequences. The feature is named Transparent native-to-ascii conversion and is not enabled by default. It is located on the Editor > File Encodings page of the Settings window. 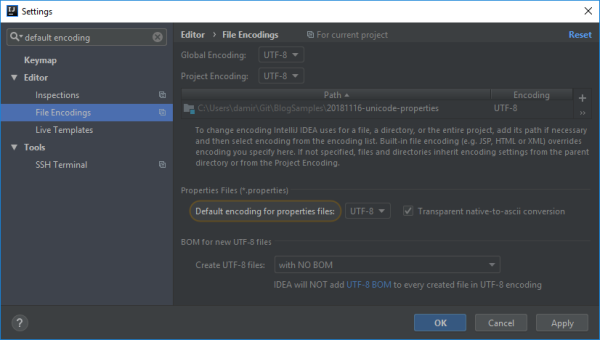 When this setting is enabled, Unicode escape sequences in .properties files will be rendered as regular Unicode literals, but they will still be saved as escape sequences so that the Java code will be able to interpret them correctly. Of course, this is only an option if you're starting a new project and have the whole stack under your control, i.e. you are writing the code for loading the .properties files yourself. Otherwise, you'll be stuck with ISO-8859-1 encoding and will have to use IntelliJ IDEA's transparent conversion feature.